Should I bike or ride? Our trip planner helps you decide. We were interested in exploring the variability of transit: can we put bounds on how long it takes to make a trip? Popular online trip planners like Google Maps give you one number: "This trip will take 35 minutes on the bus." It doesn't give you any sense of the possible variability in that number -- "it could take 35 minutes, but in the past it's taken up to 45." Even better, can we show a distribution of travel times so the user can judge for themselves how long their trip might take. 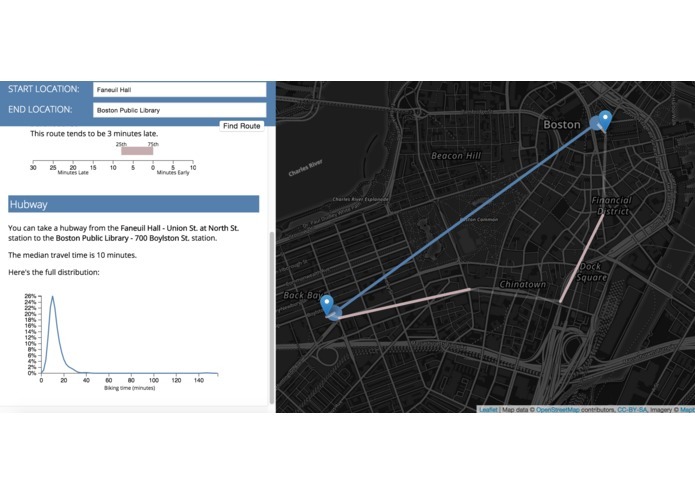 Our tool brings together historical data from MBTA buses and 1.5 million Hubway rides. You can enter a start and end destination in Boston and it will give you a Hubway route and a bus route, with added data about how variable the trip times have been in the past and how early or late buses on the route tend to be.